A simple but direct message and one which always made me convulse with (rather demented) laughter (something that was, I suspect, rather disconcerting for all my passengers). It’s not always easy to explain why things are funny (especially as, in this case, there is the implication of mass cruelty to feline quadrupeds), but it was the incongruity of it all, a sleepy, grass-grown country road flanked by ‘chocolate-box’ style thatched cottages freakishly combined with the stark warning to both motorists and cats that made me smile (even now). I guess if you add (as I frequently did at the time) the mental image of state officials, law-enforcement officers and representatives of Her Majesty’s government, all resolutely (and rather incomprehensibly) inflicting punishment upon the local feline population, then the whole thing takes on a whole new and rather darkly surreal turn. 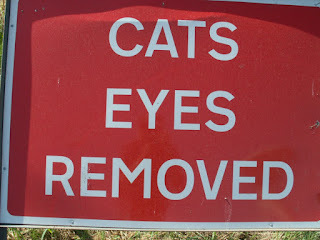 Was this particular State-sponsored attempt at body part removal, I wondered, a punishment for perceived cat-crimes against humanity (defecating upon garden lawns) or was it a stark warning to both cats (for not eating enough mice) and cat owners (for their lack of pet control)? 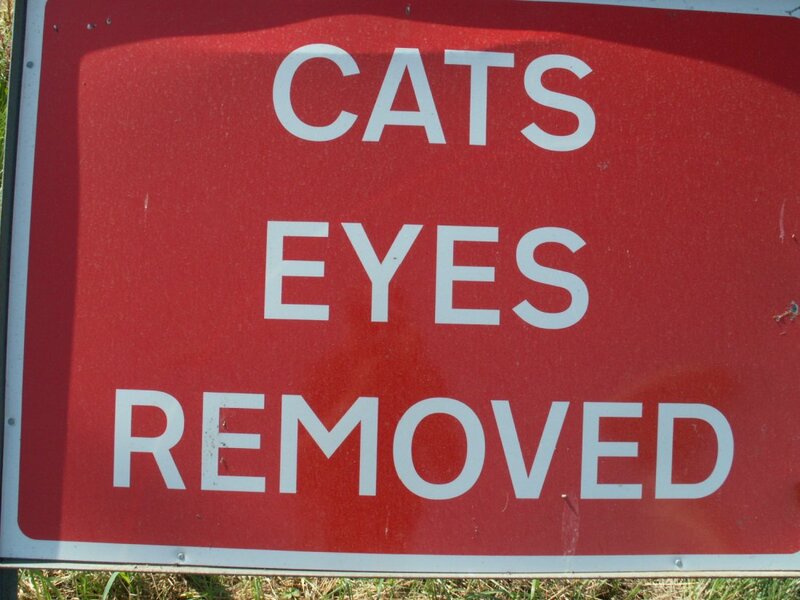 Whatever the case, as I passed the sign (and once the hilarity had died), I had the uneasy feeling that my progress would, one day, be blocked by a swarm of clawing, spitting, hissing, unfairly blinded moggies, all seeking revenge upon human-kind. .....well ok, perhaps it doesn’t, but it does highlight something which, for me, is a major (and utterly harmless) interest, namely sign watching. Attempts to modify negative human activities (such as vandalism or erosion) affecting areas of historic and natural interest using signage alone can, at times, be extremely successful, although it is fair to say that not everything works every time. Getting the right message across to the right section of society (the target audience) is, of course, rather important (otherwise why make a sign in the first place? ), but not only do different people require different messages, but sometimes, just occasionally, the message itself does not appear to have been thought through all that carefully. I suspect that the intent here was to dissuade any would-be treasure-seekers from looting a scheduled ancient monument protected by law, but this was one of those poorly thought out pieces of signage that, instead of warning people off, seemed to simply draw attention to the resource. “Thinking of Metal Detectoring” – “well gee no I wasn’t…but now you come to mention it, it does seem like quite a good idea….” Ultimately, it’s the sort of message that can have the opposite effect, positively encouraging members of the public to conduct a range of potentially damaging activities. Now such messages would definitely do it for me - there being no way that I would dare stop (or drift off to sleep) whilst driving through a designated were-wolf / vampire friendly zone. Do people really need to be told this? Unless you possess either a clear belief in an after-life or of the success of corpse reanimation, surely the purpose (and sole use) of a cemetery is all rather self-evident. Now this, I feel, is something that rather defeats the primary purpose of a toilet. If paper is, indeed, the only thing that may be deposited down the toilet, where should I hurl my own excreta? Should I venture to carefully fill the litter bins by the main car park, or should I utilise the well-tendered hedge outside the gift shop (as the foxes evidently do)? The tabletop signs stayed for a couple of weeks, but I didn’t dare eat in the canteen again for 6 months. SLEEPING PILLS - may cause drowsiness! ON THE BACK OF CAKE BOX - do not turn upside down (now they tell me). 'CHILDRENS' COUGH MEDICINE - do not drive a car or operate machinery. Stuff the cats. A severe lack of road-based studs is going to blight my life now. Mental pictures of largely undressed Chippendales-standard street menders with the usual range of fnarr-inducing power tools, shiny helmets etc. I didn't even know they were there to start with and now they've been removed.